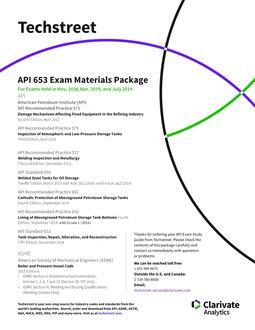 API Recommended Practice 575, Inspection of Atmospheric and Low-Pressure Storage Tanks, Third Edition, April 2014. API Recommended Practice 577, Welding Inspection and Metallurgy, Second Edition, December 2013. 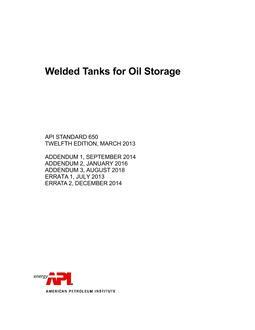 API Standard 650, Welded Steel Tanks for Oil Storage, Twelfth Edition, March 2013 with Addendum 1 (2014), Addendum 2 (2016), and Erratas 1 and 2 (2014). 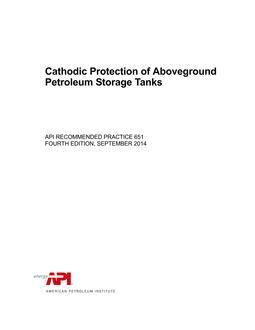 API Recommended Practice 651, Cathodic Protection of Aboveground Petroleum Storage Tanks, Fourth Edition, September 2014. API Recommended Practice 652, Lining of Aboveground Petroleum Storage Tank Bottoms, Fourth Edition, September 2014, with Errata 1 (August 2016)..
American Society of Mechanical Engineers (ASME), Boiler and Pressure Vessel Code, 2017 Editions. The price above reflects special discount for API exam candidates.